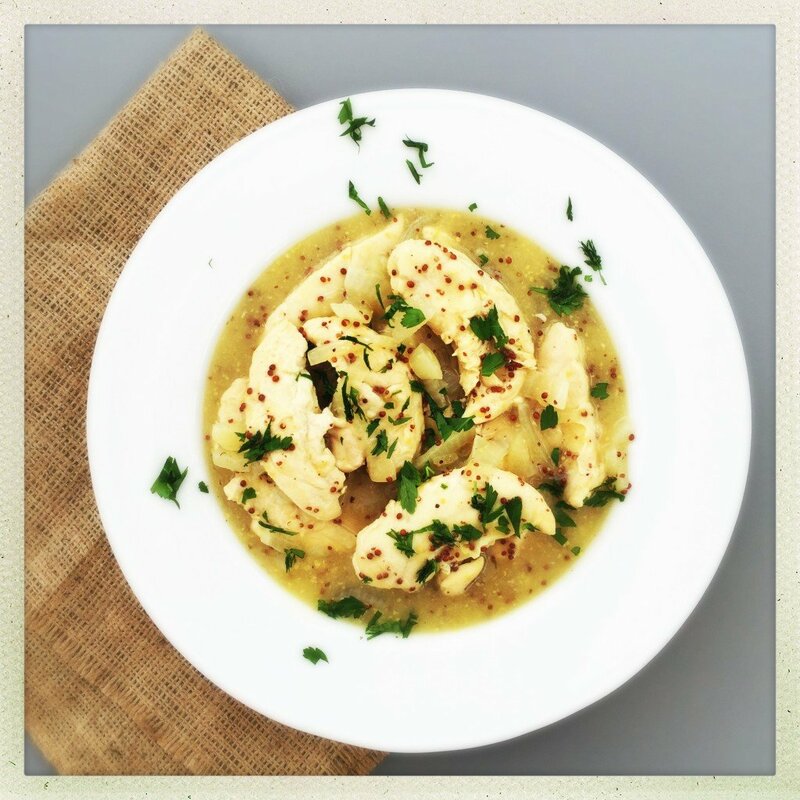 Honey and mustard chicken is so simple and so tasty and as it’s ready in just 30 minutes it’s a great midweek dinner, perfect for a busy school night. With just five ingredients our honey and mustard chicken couldn’t be easier. Add a splash of rapeseed oil to a shallow saucepan or wok style pan, one with a lid. Tip in the finely sliced onions and gently fry for a couple of minutes, add the chicken breast mini fillets, pour over the chicken stock and stir in the honey and mustard. 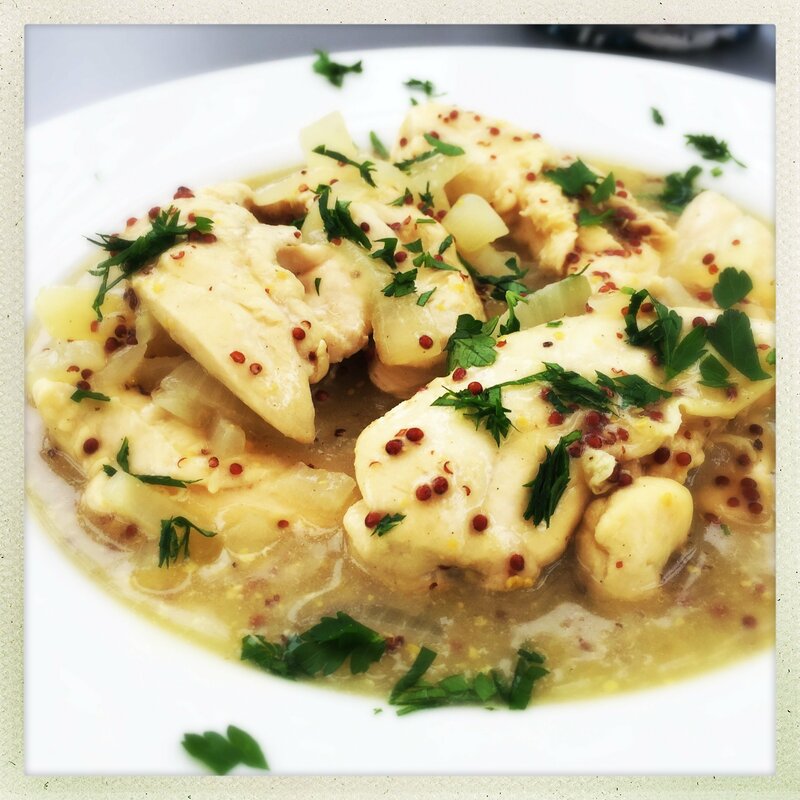 Such a simple and quick chicken recipe to make. Bring the pan to the boil, then reduce the heat and simmer over a low heat with the lid on for 15 minutes. Then take the lid off and cook for a further 10 minutes. Super easy and delicious midweek dinner. Add a splash of rapeseed oil to the pan and gently fry the onions for a couple of minutes. Add the chicken breast mini fillets to the pan and cook for a few minutes. Pour over the chicken stock and stir in the honey and mustard. Bring the pan to the boil and then reduce the heat and simmer with the lid on for around 15 minutes. Remove the lid and continue to simmer for around 10 minutes until chicken is cooked through. If the sauce needs thickening, just add a tsp of cornflour to a drop of cold water and stir through the sauce to thicken. Honey and mustard chicken is delicious served with crispy French fries, creamy mashed potatoes, over some simple boiled rice or buttered noodles. Alongside some steamed green vegetables. want some more veggies – throw in some baby button mushrooms. no onions – use a leek. go fishy and replace the chicken with salmon fillets – just reduce the cooking time. want some heat, add a pinch of chilli flakes. leftovers taste good next day reheated and served topping a baked potato or wrapped in pastry as quick little pasties.